On the left side of the webpage, you enter the Darwins that you wish to Simulate your Portfolio/Ruleset on. Custom Capital allocation is possible, just write numbers next to Darwins after space. SEPARATE DARWINS WITH NEWLINE. If you don't write capital amounts, it will assume default value, $1000. Commission is set to 0.2 -> 20% High Watermark Commission. Though it is calculated daily, not on a 3 month rolling basis like Darwinex. If you want to test without commission, set this value to 0. Test period is self-explanatory - The period for which you wish to carry out your test. You can't go below 2010-01-01, or above current date. Maximum 60 Darwins will be considered. More than that will be ignored. 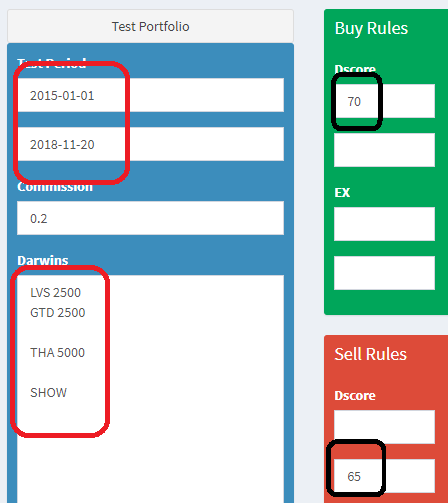 If you write SHOW at the end of your list of Darwins, Result of individual Darwins will be shown alongside Portfolio results. It is optional. Buy rules work quite like Darwinex Filters. You enter lower bound and upper bound, and if a Darwin matches All the criteria, Darwin is bought. Default values are [-Infinity, +Infinity]. If you leave a field empty, it takes default value for that field. Current Drawdown UPPER BOUND = -5 -> Meaning at least -5 or less (-6, -7 etc) current drawdown must be present to buy a Darwin. Useful for those who wait for Drawdowns to enter. Max Drawdown lower bound = -25 -> Drawdown must be -25 or higher (-24, -23 etc), otherwise Darwin is not bought. Got that? Just like Darwinex filters. So if you leave Buy rules empty, it will match all darwins at all times. So if you don't have any special buy rules, just leave it empty. Sell Rules are just like Buy Rules. Except you might be confused about the following: If you leave Sell Rules empty, it will match all Darwins at all points, so Darwins will never remain in the portfolio -> So if you have a Buy and Hold approach, set lower bound of EX in sell Rules to 11 -> Since EX never reaches 11, Darwins won't be sold, and simply held in portfolio. OpenReturn upper bound = -20 -> When Open Return (Open PL in terms of percentage) falls below -20%, we sell. This is just like setting a Stop Loss at -20%. You can also use this to set Take Profits (Set the lower bound to 10, for example - though you can't set SL and TP both at once, only one). RS upper bound = 3, PF upper bound = 5 -> Whenever RS falls below 3, and PF falls below 5 -> Sell Darwins. Rules are evaluated with AND expression. Meaning ALL of them must match. In above example of sell Rules, if Dscore falls below 60, but drawdown does not fall below -20%, Darwins WON'T BE SOLD. Remember this -> Just like Darwinex FILTERS!!! So think about your rules carefully! Unfortunately, due to technical reasons, this app does NOT support multiple client's heavy operations at the same time. If web page isn't loading, or when you click simulate, and nothing is happening - SERVER IS PROBABLY BUSY. Just write your inputs, click the button and WAIT. Your request will be queued and processed in sequential manner. Remember, maximum 60 Darwins will be considered. Data about Darwins is accurate as of 25 November 2018. I will update them every weekend. If you have troubles, comment here with as much information as possible (screenshots preferable). I will do my best to help! And since I wrote SHOW after Dawins list, here are individual Darwin performances. This tool is amazing. Period. But it is very discouraging not be able to "fix" the last months hell with any combination. I even tried some kind of "trade" for darwins that mean revert without too much success. I tried dozens of combinations and the most stable one is something like buy when there is a CurrentDrawdawn of -4, and sell at 15 profit (Openreturn). In every portfolio it improves slightly, for example that combination gets a 32.8 total return since 1/1/2017 and -5.5% DD, VS a 29.9 Total return and a -7.3% DD for Buy & Hold. For me, it doesn't deserves the effort to trade, much better the B&H. (At least, until we find some good ruleset to avoid the last months problems with B&H). But still I didn't found the Holy Grail for us B&H investors: a way to exit broken darwins without compromising too much the returns of the portfolio. To be honest after looking around and performing various statistical tests, I think the best exit strategy is Dscore. It is the best leading indicator that I have found. Now HOW to use the dscore is debatable. Dscore drops below 5th percentile? Below a fixed number? A certain percentage from recent peak? Need more analysis. I wasn't able to get good results with that. I didn't get good numbers, I guess I'll have to do more tests. The problem is that it should work in the crashed darwins (mainly for them! ), but if I use it in other "classic" and good darwins it should also work with the same parameter. This confirms my manual tests (but incredibly faster, of course, hah!!). If I set a exit strategy for an already crashed darwin list, it is better to put a tight DScore Sell rule (65-70). But that won't work for good darwins (NTI, LVS, FEG...) and the returns will be reduced a lot, so it is better to put a very low sell rule for those.. But then it won't protect against crashes. Tough dilemma. We were skilled not to buy really bad darwins that had crashed BUT if it happened we had been protected by an exit with low DScore. I think the best strategy to protect yourself against crashing darwins would be not to select them in the first place -> probably, mainly via ensuring they have long track records AND long periods of high dscore state. The golden benchmark of a darwin for me is THA. because you haven't experienced the crazy divergence at the beginning of the year. Darwins that trade with loss aversion tax me mentally a bit too much. Holding them hurts. Edit: Gotta accomodate my own mental handicaps when creating portfolios. Shouldn't take on burdens I can't handle. I have to write in my defense (Low Dscore) ..... If it can be true that low LA score is difficult to withstand, it's also true that in a portfolio things are less sharp and so even a low LA score can be tolerated IF the results confirm it can generate profit. Furthermore, using a low LA score is a way for me to keep the "recovery time" very low (3 months for now). I was born trendfollower but if "cut losers early" were enough i think we would be all rich. As investor i have to accept styles differnt from mine, otherwise I should only trade my strategies. I don't think low dscore is by itself bad (up to a certain point). I think the CHANGE in Dscore is probably a better indicator of when to ditch a Darwin. So if your dscore remains around the levels where it is the norm for your Darwin - keep calm and carry on, probably. Just wanted to drop a massive thumbs up and an even bigger thank you for this most amazing effort. As traders & developers at heart ourselves, we know precisely how taxing it is to run an idea through to production and the entire engineering lifecycle..
.. and by building this tool with the DARWIN API all by yourself, it's a testament to how motivated you are to making the asset class a success, leveraging your knowledge and talent for everyone's intellectual, financial and social benefit. It's people like you who drive real progress - it takes only one lone nut to start and steer an entire movement, thank you for joining in! We're dancing along with you. My thanks Great thing about Darwinex is that your success can be mine, and mine yours, all without stepping on each other's toes. Best wishes! Since I started experimenting with Darwins, I've missed this tool. R code that defines UI and handles client access. This is totally incredible! Thanks a lot for sharing it with all of us! !